Floral Statements Will Blow You Away! I hope you’ve been following my experiments with Floral Statements? I truly believe that Floral Statements will blow you away! It is so easy to use and has so many different looks depending on what media you use. Someone recently reminded me that all of us are multi media card makers. We use card stock (sometimes different types, colours and weights), we stamp, heat emboss or dry emboss, add die cuts or we use ribbon and other embellishments on our cards. All of these are types of “media” or things we use to create an overall design. 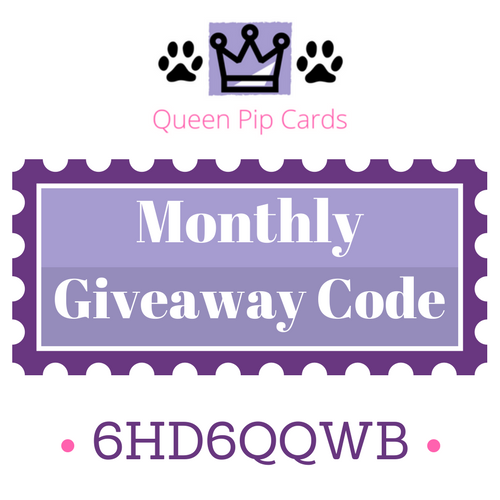 Put more than one on a card and you’re a multi media card maker! Not something I thought I’d count myself as! Would you? Anyway, I digress (again!) Get on with the card Pip! 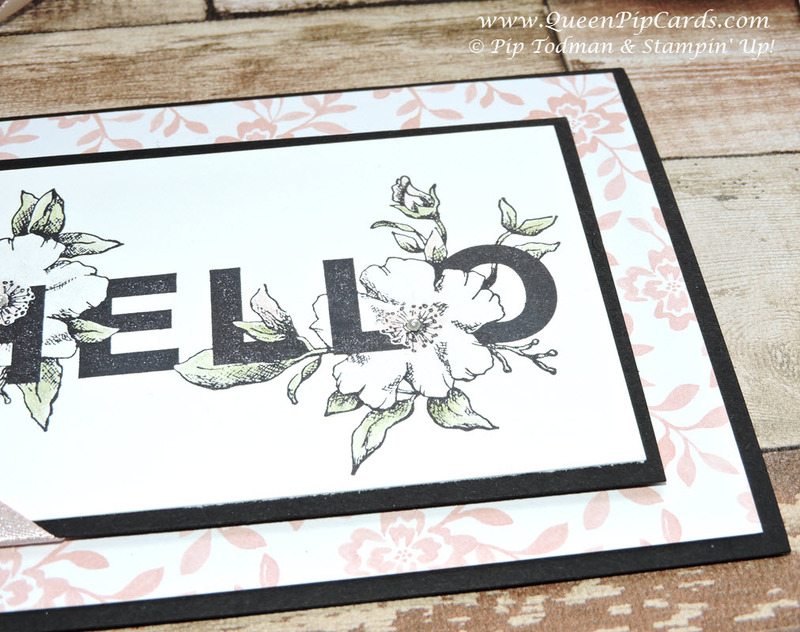 Today I’m showing you the other sentiment in the Floral Statements stamp set. Hello! Such a great sentiment, can be used for anyone really. These are my team welcome cards for this month because I always want to say Hello to them! The stamp was inked in Basic Black Archival ink, stamped onto Whisper White. Allow it to dry so you don’t get any bleeding and use Wink of Stella to pick up Powder Pink and Pear Pizzazz ink. This was used to colour in the leaves and blossoms but it’s really hard to pick that shimmer up on camera. Believe me, it’s gorgeous in real life! Add a bit of Shimmer ribbon to a black & white mat and layer and you’ve got your topper sorted! Pop that up on dimensionals onto your Fresh Florals Designer Series Papers, onto a Basic Black card base and your card is now complete. 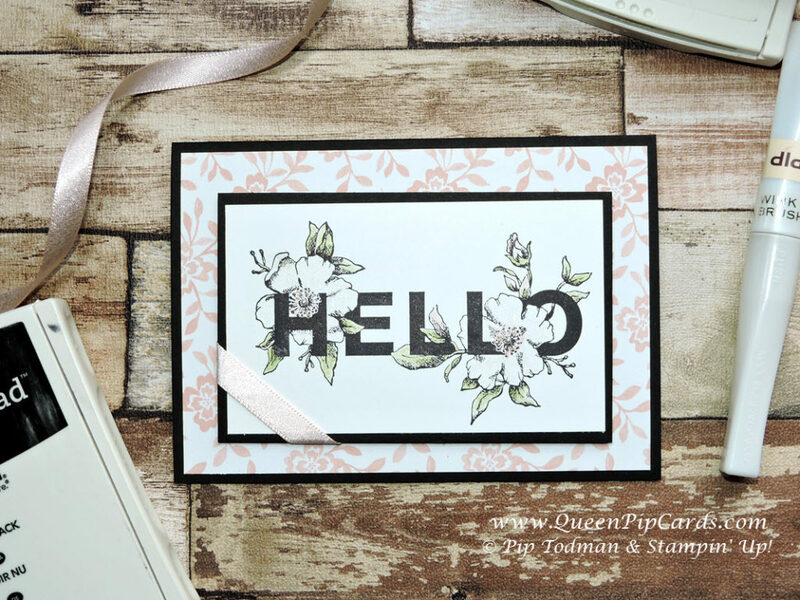 You could also use any of the other colours in the paper pack to create another array of beautiful cards to say Hello to someone special in your life. Want to make this at home? 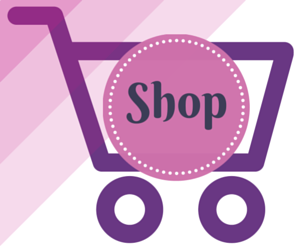 All the products I recommend you use are listed below. The card sizes are A5 folded Basic Black cardstock, Fresh Florals paper is 14.4 x 10 cm, Basic Black layer is 12 x 7.5 cm and the top Whisper White layer is 11.5 x 7. Until next time, I hope you’re also seeing all the other cards I’ve made with this stamp set over in my Queen Pip’s Crafty Corner Facebook Group!